During last few centuries the environment has been impacted by anthropogenic activities with increasing speed. The impact has caused loss of natural character and function of many components of the environment. The tendency of changing natural systems is obvious all around the world and the pressure is exponentially increasing with growing human population. The impact on a natural eco system is demonstrated by the ecosystem degradation and decreasing ability to recover. At present, numbers of eco systems are so heavily affected that they are not able, without human action, to be recovered and to accomplish natural function. The negative impact of human activities on the environment slows down during last few decades due to accepted legislative measures and the degradation of the environment has been minimized. One of the main legisla tive tools to minimize the anthropogenic impact on the environment is environmental impact assessment (EIA) (in some sources 'environmental impact analyses'). EIA evolved during the 1970s and 1980s in developed countries, in response to the need to address potential impacts of proposed development early in the develop ment planning, rather than at the final design stage. Experience indicated that project completion targets and financial imperatives in place by the final design stage, largely preclude the consideration of alternative development arrangements or process securing better environmental outcomes. To understand properly an EIA, it is necessary to under stand the terms 'impact' and 'effect'. They are frequently used synonymously, although some have advocated differ entiating between natural or man induced changes in the biogeophysical environment, effects, from the consequence of these changes, namely impacts. An impact has both spatial and temporal components and can be described as the change in an environmental parameter, over a specified period and within a defined area, resulting from a particular activity compared with the situation which would have occurred had the activity not been initiated. Environmental systems are not static, but change over the course of time even without the influence of man. Some are very dynamic, while others only change imperceptibly. In order to make predictions about impacts, assumptions have to be made about natural changes. A major deficiency of many studies has been failure to establish a time frame indicating when impacts are likely to be manifest. Impacts are also site specific and hence determination of their spa tial distribution is also important. Spatial aspects are usually considered more adequately than temporal ones. It is useful to distinguish between direct (primary) and indirect (sec ondary, tertiary, and higher order) impacts. Some impacts are a direct consequence of a particular activity. For exam ple, without adequate mitigating measures, construction of a dam on a river will prevent the upward movement of migratory fish. This would be a direct impact of the project. Other impacts, however, occur as a result of changes in a chain of environmental parameters. Thus, to continue this example, there would also be indirect impacts upon fish population. Reductions in stream flow and turbulence would lower the oxygen tension and affect survival. Reduced water flow would also affect the nature of the streambed, the consequent siltation making conditions unsuitable for migratory fish to breed, the changes in habitat nature will change the possibility for fishes to hide, feed, rest, and consequently the diversity of the aquatic commu nity will change. EIA can be defined as ''a process by which information about the environmental effects of a project is collected, both by the developer and from other sources, and taken into account by the relevant decision making body before a decision is given on whether the development should go ahead.'' The legislation of the European community requires that EIA includes: ''A description of the aspects of the environment likely to be significantly affected by the proposed project, including in particular, population, fauna, flora, soil, water, air, climate factors, material assets, including the architectural and archaeological heritage. This description should cover the direct effects and any indirect, secondary, cumulative, short , medium , long term, permanent and temporary, positive and negative effects of the project.'' It can be defined more simply as an assessment of the impacts of a planned activity on the environment. In addition EIA will consider aspects such as project alternatives and mitigation measures that should be implemented if the development is allowed. EIA was for a long time focused mainly on assessing direct negative impacts on the environment, even the definitions required to assess all type of impacts (as mentioned above). It was recognized from the inception of EIA that many of the most devastating environmental effects may not result from direct impacts from individual project, but from the combination of effects from existing developments and individually minor effects from multiple developments over time. As result, assessment of indirect and cumulative effects was included to the EIA process. Notwithstanding significant advances in EIA in recent years, there are only a few EIAs considering the assessment of indirect effects, cumulative effects, and impact interactions, as this process is often thought to be difficult due to technical and institu tional barriers. In countries such as Australia, the cumulative effects are addressed by planning or resource management agencies on a regional or catchment wide basis, together with projections in future development demands, enabling the identification of polices guiding the allocation of sustainable cumulative impacts across potential future developments. In recent years, in the inter ests of economic efficiency, the quantum available for allocation has been traded using market systems. • the use of indexes or weightings or other decision tool to rank the alternatives. The origins of EIA lie in the USA in 1969, with the passage of the National Policy Act (NEPA). Since that time EIA has been widely used all around the world as a valuable tool for decision making. The spread of EIA, however, has not just been confined to national environ mental protection legislation. Major international funding organizations such as the World Bank have also embraced the EIA system to add environmental probity to their investments. Moreover, multilateral organizations, such as the United Nations Environmental Program (UNEP) and the World Health Organization (WHO), have also integrated EIA into their decision making procedure. Since EIA came into being it has grown and developed into a viable environmental planning and decision mak ing tool. Over the years, it has become increasingly evident that the authorization of proposals is not the sole decision point. There are many decision makers involved in the evaluation of a set of development pro posals and the influence of most of them is exerted long before the submission of an application for formal project authorization. Indeed, the greatest contribution of EIA to environmental management may well be in reducing adverse impacts before proposals come through to the authorization phase. Although generally considered a tool of project management, EIA is equally applicable at other levels of planning (assessing legislation, programs, policies, and plans). EIA now not only provides scientific information about the physical environment of a devel opment area to decision makers but also acts as a public consultation document and an environmental manage ment tool for the developers. In recent years, the field of EIA has expanded enormously with the evolution of EIA specialisms such as 'social impact assessment' (SIA), 'environmental health impact assessments' (EHIA), and 'strategy environmental assessments' (SEA), which seeks to determine the effects of implementing policies, plans, or programs on the environment. Any EIA consists of three key stages (Figure 1). The first preliminary assessment stage involves the identification and collection of relevant information, which is called screening. During this step, the decision is made on whether full EIA is required for the project. If the decision is yes and it is necessary to undertake a full EIA, then the second stage starts. The second stage, called scoping, identifies what constitutes relevant information to be identified and assessed with respect to the key impacts of the proposed develop ment. This type of information is often called the baseline data. The baseline data must then be analyzed and com pared to the environmental situations with and without the development. This second phase of EIA consists of impact prediction and the impact assessment stage. The results of all this data collection and analysis are usually reported to the relevant decision makers in an 'environmental impact statement' (EIS). The final stage comprises a review of the EIS and its adequacy as a basis for the competent authority to make the decision on 'development conditions'. In view of the potential for significant costs in data collections and assessment, and delays in project approval associated with the EIA process, planners and environmen talist accept the principle of'adoption of levels of assessment commensurate with the significance of the issue raised'. Figure 1 The environmental impact assessment process and its stages. The most common stages of the EIA, their parts and their connection and importance in decision-making process. EIA (Table 2): these list may slightly vary among countries. Screening of these projects must lead to a yes decision that EIA is required. The main considerations in preparing such lists are project type, size (size is a crucial parameter, similar activity which will be propose in smaller scale can be excluded from EIA), and the consequence of likely impacts. Project location is also a part of the impact identification, as a development in one area may be far more severe than if it were located elsewhere. New types of development or processes should also be considered, as precedents against which risk of impact can be assessed are not available. The magnitude and significance of the project impact is deter mined by the type of project and its location and it can result that establishing rigid screening criteria may be unsatisfac tory. The screening follows a number of steps, which should lead to the decision if a full EIA is required. After the decision is made the decision and reason for making this decision has to be recorded and publicly notified. Impact on people, human health, fauna and flora, soils, land use, material assets, water quality and hydrology, air quality, climate, noise and vibration, the landscape and visual environment, historic and cultural heritage resources, and interaction between them. Extent of the impact (geographical area, size of the affected population/habitat/species) Magnitude and complexity of the impact Duration, frequency, and reversibility of the impact Mitigation incorporated into the project design to reduce, avoid, or offset significant adverse impact Transfrontier nature of the impact with decision making process about political objectives, proposed projects, and changes in land use. EIS is defined as scientific assessment of changes present in the environ ment by human activities. Usually it describes condition of the environment before and after the proposed action. • any other matters to be included. Construction of reservoir (volume >10 millions m3)a Pumping of ground water (> 10 millions m3yr 1)a Water consumption (> 100 millions m3yr 1)a Construction of waste water treatment plant Construction of sewer system aValues accepted in EU countries. In case of the activities the size of the activity which will need to have mandatory EIA is dependent on each country's legislation. More activities belong to each listed category. This is just an example. The finding of scoping defines the 'scope' of the environ mental information to be submitted to the competent authority and terms and references for the environmental studies to be undertaken to compile that information. The result of scoping is a 'scoping report' and 'opinions' and it should be provided by the developer to the competent authority. In particular, scoping reports and opinion will always identify the types of environmental impacts to be investigated and reported in the EIS. Scoping involves a scoping consultation, which is in more developed systems extended widely to all interested parties. • It helps ensure that the EIS used for decision making provides a comprehensive picture of the important effects of the project, including issues of particular concern to affected groups and individuals. • It helps focus resources on the important issues for decision making and avoid wasted effort on issues of little relevance. • It helps ensure that the EIS provides a balanced view and is not burdened with irrelevant information. • It stimulates early consultation between the developer and the competent authority, and with environmental authorities, other interested parties, and the public about the project and its environmental impact. 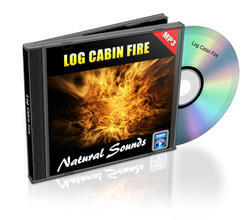 • It helps effective planning, management, and resour cing of the environmental studies. • It should identify alternatives to the proposed project and mitigation measures which ought to be considered by the developer. • It can identify other legislation or regular controls which may be relevant to the project and provide opportunities for the necessary assessment work for different control systems to be undertaken in parallel, thereby avoiding duplication of effort and costs for all concerned. • It reduces the risk of delays caused by request for further information after submission of the develop ment consent application and EIS. • It reduces the risk of disagreement about impact assess ment methods (baseline surveys, predictive methods, and evaluation criteria) after submission of the EIS. To allow competent authority to provide a 'scoping opi nion', the developer will have to provide the competent authority with some information on the project. The list of information needed for 'scoping' is the same as list for 'screening' except that at the 'scoping' stage more detail is likely to be needed. Scoping is therefore primarily focused on identifying the impacts to be assessed and which of these are most important. A useful way of identifying the potential impacts of a project is to identify all the activities or sources of impacts that could arise from construction, operation, or decommissioning of the project, and to consider these alongside the characteristics of the project environment that could be affected, to identify where there could be interactions between them. Reviewing EIS is a process establishing whether an EIS is adequate for the competent authority to use it to make the decision on 'development consent'. It is important to note that the decision will usually involve consideration of other information in addition to the EIS, but the aim of review is to check that the EIS is adequate. 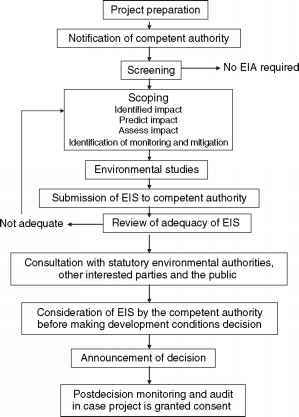 In a number of countries review of adequacy of the EIS before they are used for decision making is a man datory stage in the EIA procedure. In these cases the review may be undertaken by the competent authority or by an independent organization on behalf of the competent authority. Where EIS is considered to be inadequate, the developer will be asked to provide addi tional information and the development consent decision process will not start until information has been provided. • communicating effectively with consulters and general public so that they can comment in a useful manner on project and its environmental impacts. The final decision with respect to project authorization may appear a logical point at which to terminate appraisal. If appraisal is halted at this stage, however, there is no way of knowing whether predicted impacts actually occur. EIA should be characterized by a stream of data collection and analysis running from informa tion on environmental status at the outset, baseline data, through a gradual process refinement and aug mentation during impact prediction to the collection of data on actual impacts. Postimplementation it means monitoring data can be used either to refine the pro posal, perhaps by the inclusion of additional remedial measures and the relaxation of constraints found to be unnecessarily restrictive, or to modify the decision. In the worst case, it may be necessary to rescind author ization if predictions severely underestimate adverse impacts. Data collection after proposals have been implemented can also be used to assess the accuracy of EIA. Such audits involve a comparison of the pre dicted situation with the situation that actually occurs. The success of the audit is dependent on the complexity with which the EIA was originally carried out. Potential impact must be described in EIA adequately in terms of their anticipated magnitude, spatial distribution, and timing so that accuracy can be assessed. It is necessary to keep in mind that by approving EIA, the EIA process is not finished. The process continues during the implementation as well as after the implemen tation is finished, by monitoring and audit. Monitoring and audit should give information about the stage of the environment after implementation of proposal and can be understood as the control of EIA. In some cases they can be used to refine the proposal, perhaps by the inclusion of additional remedial measures and the relaxation of con straints found to be unnecessarily restrictive, or to modify the decision. EIA is a cyclical process, theoretically, which forms a self sustaining, positive feedback loop. Once the EIA pro cess has been completed what has been learnt about that environment, the methods used in the EIA to identify, predict, and evaluate impacts and the relationship between the predictions made and actual impacts that occur postdevelopment can all be used in future EIAs, refining and hopefully improving the whole process. EIA has been so widely adopted in project planning that there is a risk that its use will be confined to the appraisal of projects. The objective of EIA is not to force decision makers to adopt the least environmentally damaging alternative. If this were the case, few develop ments would be done. Environmental impact is one of the issues addressed by decision makers as they search to balance the often competing demands of development and environmental protection. Social and economic fac tors may be far more pressing. Major development projects often have such profound implications that they dictate the course of future policy. There are a wide range of techniques and methods for impact assessment, which are available to undertake EIA. Most have been developed during the 1970s in response to NEPA. Many of the more complex methods were initially developed by US government agencies that often dealt with large numbers of similar projects. Since their original design, many of these methods have been refined or altered and applied to other types of development. There are numbers of possibilities how to divide methods and tech niques used in EIA processes. They can be divided into those that are analytical or quantitative in nature and those that are planning orientated. The following are some examples of some techniques belonging to each of these groups: analytical methods are spatial analysis; network analysis; biogeographic analysis; interactive matrices; eco logical modeling; and expert opinion. Planning methods are multicriteria evaluation; programming models; land suitability evaluation; and process guidelines. 1. Checklists are the easiest of all methods to use, consisting of a list of various factors that may be affected by the development. Checklists are useful in identifying impacts generally, ensuring that impacts are not over looked. The main disadvantage of the checklist is that they must be exhaustive if no serious impact is to be overlooked. However, checklists do not identify relation ships between impacts and are therefore very limited in their application to indirect and cumulative impacts as well as impact interactions. 2. Matrices are the most commonly used methods in EIA. Matrices display in two dimensional format the relationship between project actions and the environmen tal factors. The first matrices were used by Leopold, who created complex matrices with 88 environmental para meters along one axis and 100 development characteristics along the other. The magnitude and significance of the impact is assessed on a 10 point scale and the score is included in each cell indicating where a likely impact is anticipated. Recently, there are numbers ofmodifications of Leopold matrices. Matrices have been modified to display not only direct relationships between development actions and the environment but also to give indications of impact magnitude through impact weighting systems. However, there are major problems with such weighted matrices, not least being the problem of subjectivity in attaching numerical values to different impact types. Additionally, conventional matrices deal only in direct impacts and are not, therefore, appropriate to the assess ment of indirect and cumulative impacts as well as impact interactions. Condensing information on complex environmental variables into some manageable form is a problem of assessment. Aggregation, sometimes called weighting and scaling, methods represents a technical fix to this problem. Advocates favor combing numerical values indi cative of individual impacts into a surrogate reflecting overall impact. These methods have two elements, scaling and weighting. In the 'environmental evaluation system', value functions have been concocted to translate the state of individual environmental parameters into arbitrary, environmental quality indices all expressed on the same scale. Environmental quality scores are multiplied by the appropriate weightings and added to give a total score of environmental quality for each option under considera tion. Many subjective elements are subsumed within both the weighting scheme and the value functions. In effect, the basis for a decision is created by the method. The preferred option and, hence, the only decision that logi cally can be taken, is the one with the highest score for environmental quality. 3. Quantitative methods cover a broad spectrum of techniques, from mathematical and numerical models to sophisticated computer models. Fundamentally, quantita tive techniques attempt to compare impacts and producing a relative, composite index. Despite the appeal of quantitative techniques through their ability to provide numerical evidence to support impact assessment they have many weaknesses such as their complexity and can be easily manipulated by changing assumption underly ing the model. In terms of assessing direct and cumulative aspects as well as impact interactions, quantitative tech niques can be used to identify impact relationships but only the relevant parameters are known and included in the model. Moreover, these techniques reduce environ mental components to discrete units, often losing a great deal of information in translation to numerical form. 4. Network methods are, theoretically, the most appropriate. Network method is a hybrid approach devel oped by Sorensen. Such methods recognize that environmental systems are composed of complicated, interrelated components and attempt to model these interactions. By following development impacts through the web of environmental relationships the effects of these impacts can be predicted through changes in the model. The drawbacks of using network are that they are very time consuming in development and require highly specialized knowledge to accurately create a network for each environment under consideration. 5. Overlay maps have been in use for a considerably long time in environmental planning being ideally suited for the consideration of spatial aspects, before even EIA was a recognized technique. By using a series of annotated base maps each reflecting a different environmental com ponent of the development a composite picture of the developments impacts can be generated. A total impact can be shown by this technique. The advance of computer graphics and geographical information systems (GISs) has allowed weightings to be given to different types of infor mation and more data to be analyzed with this technique. The disadvantage of this method is that at their most complex they are very capital and skill intensive whereas at their most basic level they are limited to a small number of impacts that can be overlain successfully, about a dozen, although photographic and hierarchical clustering approaches overcome this practical constraint. Computer development has revealed the full potential of overlay approaches. The raw data files can be differently manipulated and using different software can give good identification of locations with the highest impact and the minimal impact. Moreover, overlays will not identify secondary impacts and requires that the user has already identified the individual impacts before the technique can be used. The second group of EIA methods, described as evalua tion methods, can be used to assess the significance of identified impacts. Evaluation techniques can be classified into two groups. To the first group belong 'cost-benefit analysis' (CBA) techniques. CBA techniques rely on assigning monetary values to resources and calculating whether the economic gains of a development will out weigh the economic losses throughout the life span of the development. CBA techniques, when used solely for the purpose of EIA, have fundamental drawback in that many environmental resources are intangible and, therefore, cannot be priced in a meaningful way, for example, air quality or the value of endangered species or landscape. This factor prevents CBA being used as a comprehensive tool for impact evaluation in EIA. The inability of CBA to accommodate intangibles had led to the emergence of other monetary valuation techniques based on CBA that claim to be able to include intangible resources within their calculations. The valuation of intangible resources can be achieved through a variety of methods which measure, either directly or indirectly, the preferences of consumers of environmental resources. There are many pitfalls in utilizing these methods and their complexity is such that their use is confined to academic research pro jects and large scale public sector development rather than project EIA. The second major group of EIA evalua tion techniques termed multicriteria methods seeks to overcome some of the strictly monetary deficiencies of CBA by giving weight not only to tangible resources but also allocating weight to the differing views and goals from within society at large concerning environmental change. Similar to the weighted matrix predictive tech niques detailed above the scoring systems used in most multicriteria analyses are open to subjective interpreta tion and manipulation. There are two most popular multicriteria methods. The first one is the 'multi attribute utility theory' (MAUT) which relies not just on the assignments of arbitrary units to value impacts, but also attempts to incorporate the values of key interest parties. Consultation with key interest parties, such as local group, has been identified as an important factor that is often overlooked in the identification of indirect and cumulative effects as well as impact interaction. Taking this concept a stage further is the second method, the Delphi method, which attempts to build the views of key parties into the evaluation process by the collection of expert opinion and gaining consensus on the issues being considered. In practice, the application of all these methods for the identification and assessment of impact is either limited or has not been developed to its full potential. It is widely accepted that a single method would be unlikely to meet all the criteria required for effective assessment of impact. It would be expected that various techniques and methods in an adaptive approach would be combined to perform individual assessment. The most suitable combination of methods will depend on the nature of the problem, pur pose of the analysis, access to and quality of data, and available resources. Timing. It is important to integrate environmental impact assessment at an early stage of project planning. Where it is seen as an extra or as 'add on' to projects which already have been determined on the basis of their engineering, technical, and economical feasibility, it can perhaps suggest mitigation measures, but can have no real effect on the project design. When integrated early in project planning it can result in projects with built in mitigation which is designed to minimize negative effects and maximize benefits. Personnel. The success of an environmental assessment is very much dependent on the individual, or team, responsible for preparing it. In view of the great diversity of project and program types to which assessment has been and can be applied, it is difficult to determine an ideal profile for an 'EIA preparer' which would fit every situation. Some type of project can be assessed adequately by a single person with the right qualification and experi ence working together with host government officials and local experts over a short period of time. Other projects demand interdisciplinary team of experts to carry out extensive field investigations and data gathering. Information. The need for reliable data and information is a common theme. Where an adequate database is miss ing it becomes particularly important to work closely with local universities, research institutes, and the affected public to obtain an insight existing environmental condi tions. The time and expense involved in 'starting from scratch' makes it advisable to tie data gathering to the major environmental impacts identified during scoping. See also: Environmental Impact Assessment and Application - Part 2. Canter LW (1996) Environmental Impact Assessment. New York: McGraw Hill. Erickson PA (1994) A Practical Guide to Environmental Impact Assessment. San Diego: Academic Press. Glasson J (2005) Introduction to Environmental Impact Assessment: Principles, and Procedures, Process, Practice and Prospects. New York: Spon Press. Lawrence DP (2003) Environmental Impact Assessment: Practical Solutions to Recurrent Problems. Princeton, NJ: Wiley. Morgan RK (1998) Environmental Impact Assessment: A Methodological Approach. Norwell: Springer. Morris P and Therivel R (2000) Methods of Environmental Impact Assessment, 2nd edn. London: Spon Press. Morrison Saunders A and Arts J (ed.) (2005) Assessing Impact: Handbook of EIA and SEA Follow Up. London: James and James/Earthscan. Munier N (2004) Multicriteria Environmental Assessment: A Practical Guide. Norwell: Springer. Raymond K and Coates A (2001) Guidance on EIA. Luxembourg: European Communities. Wathern P (ed.) (1992) Environmental Impact Assessment. Theory and Practice. London: Routledge. Wood C (1995) Environmental Impact Assessment: A Comparative Review. London: Longman.